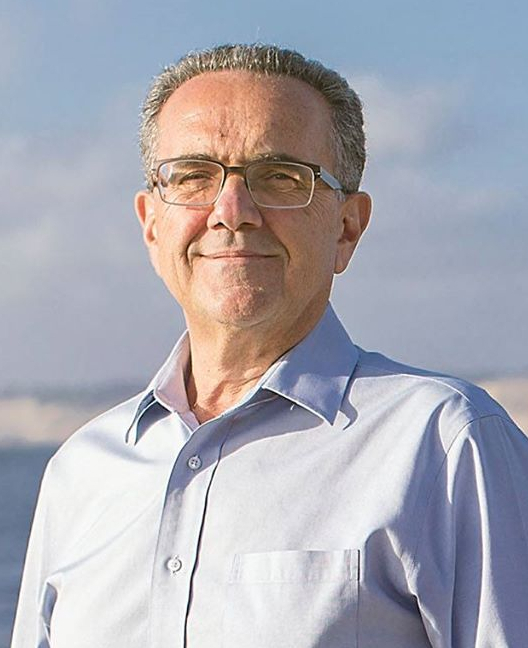 I t was announced today that civil engineer, three-term Chair of the San Diego Community Planners Committee, and friend of BikeSD - Joe LaCava - has ended his bid for the San Diego City Council District 1 seat. We cannot mask our disappointment for Joe. When BikeSD made Joe LaCava our first endorsement of the 2016 election cycle, it was the easiest decision the organization has ever made. Joe is an absolute champion of safe streets. And among the many causes he has selflessly dedicated himself to over many years in San Diego, helping BikeSD work toward the goal of making San Diego a world-class city for bicycling was near the top of the list. As a founding supporter of BikeSD, Joe's commitment was unmatched. Few people in San Diego are as committed to the betterment of the city in the way Joe is - and even fewer match their enthusiasm with an expert's policy knowledge and a will to implement it. Thanks, Joe - for all you've done for BikeSD and for the City of San Diego. You would have been a hell of a councilmember, and we know you'll find a terrific way to keep this city moving forward for the better. 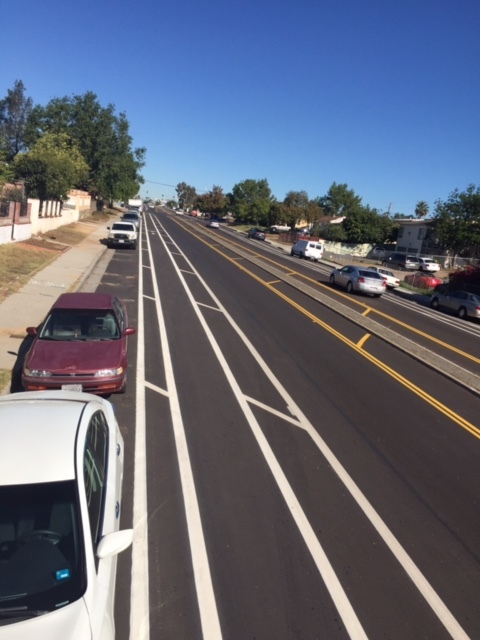 About a month ago, City Heights got its first road diet. We've had a drought of road diets in this city since the 4th and 5th Avenue buffered bike lanes were installed in 2014 so this has been a welcome change. The status quo as you can see below, was just awful and dangerous, and in a school zone to boot! This road diet came after a unnecessarily controversial vote at the City Heights Planners Committee (the advisory board to City Council on all land use matters) back in August this year. 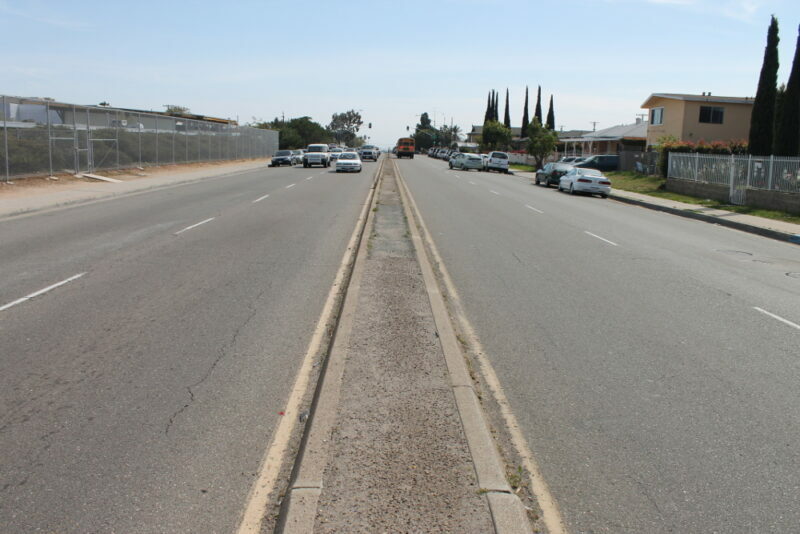 Fairmount Avenue was scheduled to be repaved and city staff presented a plan to put Fairmount Avenue on a diet between Redwood Avenue south all the way to Home Avenue, by installing a buffered bike lane. 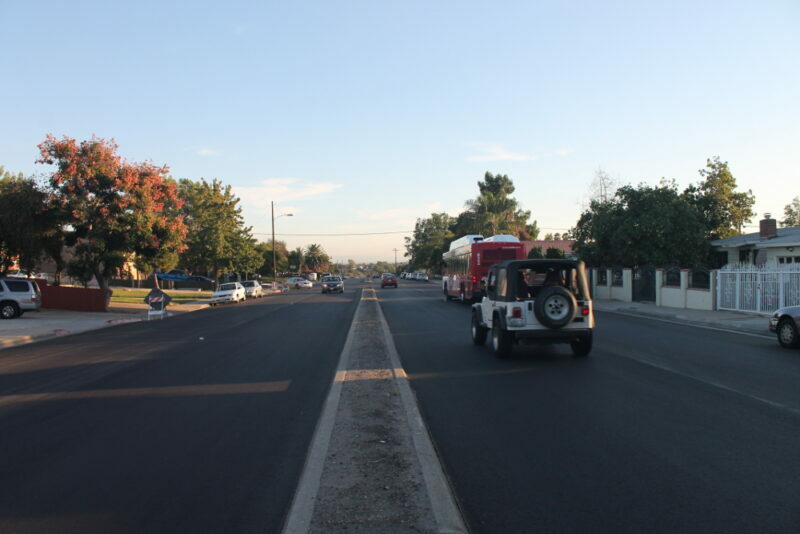 Georgette Gomez (currently running to replace Councilmember Marti Emerald in 2016) made the motion to approve the restriping project along with additional lighting, traffic signals and signage to make the new striping safer for all users. The vote was close and passed 8 to 6. Committee member, David Nelson, broke the previous tie breaker by voting to support the project. He doesn't care for pop-outs, and only wanted to support the buffered bike lanes. Nelson initially thought that the vote to support bike lanes also included a vote to support pop-outs. 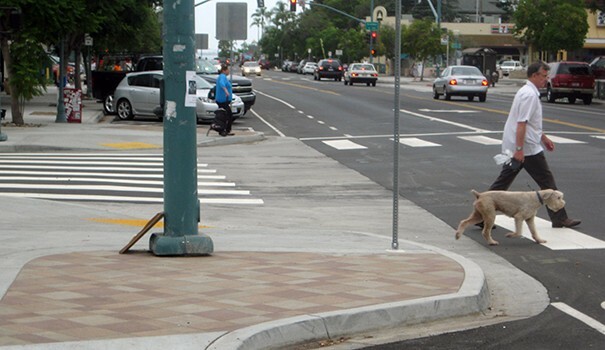 His vote was critical to ensuring the implementation of City Heights' first buffered bike lane. The City Heights Committee members who voted against the buffered bike lanes and against public safety were: Jessie Sargent, Mark Kassab, Mazda Mehraz, Samuel Supranovich, Abdullahi Yusuf and Bob Lief. If this close vote doesn't speak to the importance and power of getting involved in your local community, nothing will. Thanks to city staff in overseeing the project and implementing it, and much thanks to Councilmember Marti Emerald who showed up in person to speak in support of the road diet on Fairmount Avenue as it was (and is) a public safety issue. 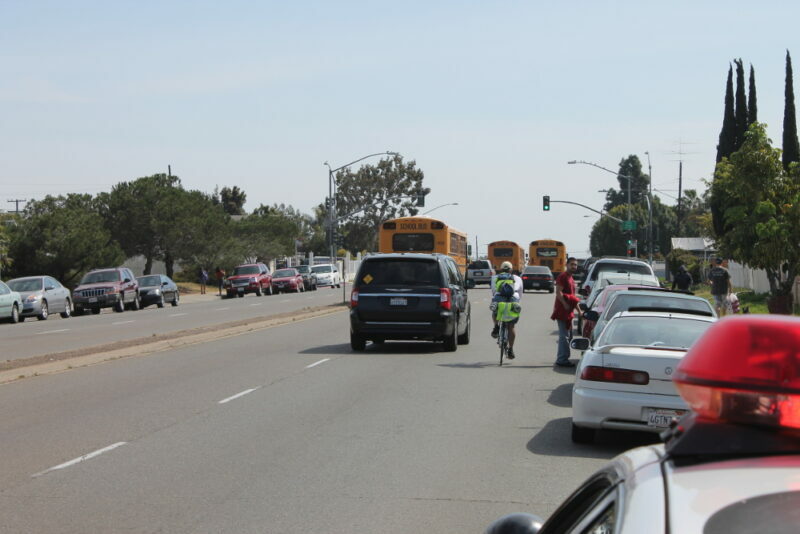 Back in 2010, the City Heights CDC prepared a Walk to School Report identifying the dangerous corridors in City Heights that prevented safe walking and biking to schools. They then worked to ensure that projects like the Fairmount Avenue bike lane would get passed. A scary place to park a bicycle is right next to a looming parking garage with a ramp from the garage right above your head! I attended a meeting at the Development Services Building located at 1st Avenue and A Street about a month ago and found that there was not a pole or a bike rack to be found where I could look my bicycle up to. I wound up locking my bike up to the "A Street" sign which was not pleasant to either get to or lock my bike up to. See the google screenshot on your left to see what I'm referring to. I was a bit unhappy to not have any spot to park my bike! After my meeting I complained about my experience with my Business Coordinator, Kyle, who then made a request with the city to install bike racks and this afternoon he got word (and proof) that new bike racks have been installed in front of the Development Services Building on B Street. So exciting! All these racks need are more bicycles parked next to them. Thank you to the city staffer Ahmad Erikat for getting these racks installed so quickly. If you'd like some bike racks installed in the public right of way, don't be shy to get in touch with Traffic Ops. If you want bike racks to install on your private property and support our work simultaneously, get in touch with Kyle. He's waiting to hear from you. Photo via Ahmad Erikat.. Thanks Ahmad! December Nights photo by Emily Valdez. 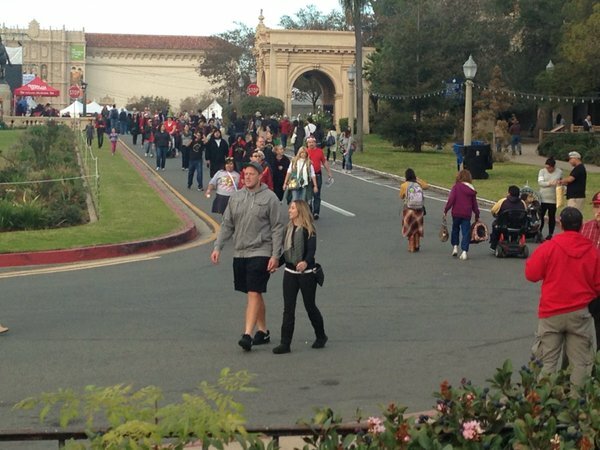 This past weekend was December Nights, the annual holiday event in Balboa Park where almost all of the main park is closed to vehicle traffic. Not surprisingly, San Diegans respond by showing up in crowds. The crowds have spawned a twitter account complaining about said crowds. 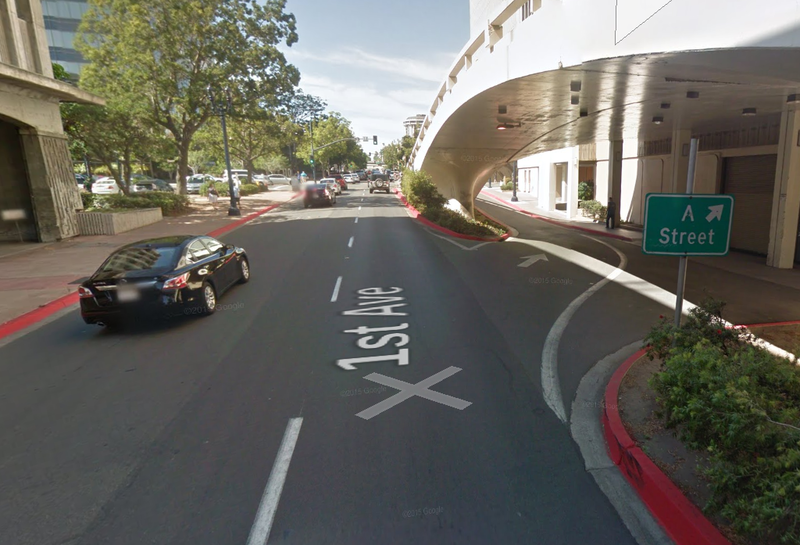 (via) Maybe San Diegans aren't too enthused having all the available public land dominated by the automobile? Maybe I'm just dreaming. Theresa Owens got 19 years for hitting and striking a group of riders, one of whom has been injured for life. Much thanks to the District Attorney's Office for keeping on this case. In cool news, maybe San Diego will one day be home to a binational bike lane. Man Tracks Stolen Bike, Poses as Buyer to Catch Thief. Don't do this as it could lead to bad outcomes in addition to a missing bicycle. Our own SDPD has a great bait bike program where the punishments aren't punitive as much as they just serve as a deterrent. More details about the bike bait program can be reviewed in the Bicycle Advisory Committee meeting minutes from this past May. If you need another reminder to not deal with the thieves on your own, here is a reminder. These thieves have no conscience or shame. You can prevent your bike from being stolen. 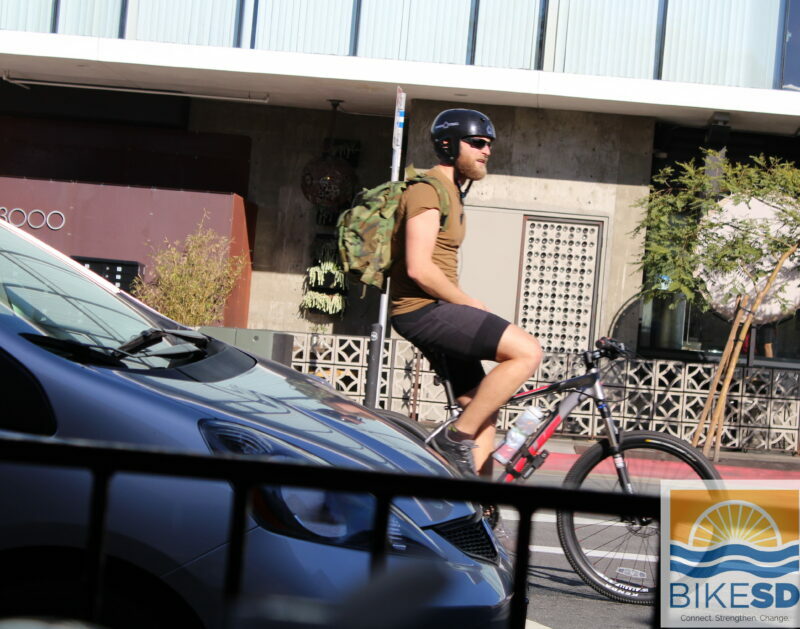 BikeSD board member and North Park resident, John Anderson, isn't impressed with North Park being considered a bike friendly neighborhood, North Park – San Diego’s Weak Excuse for a Bike Friendly Place. Peninsula Community Planning Board seeks to add more parks and a bicycle connection between "the Portuguese Hall to Cabrillo National Monument along Avenida de Portugal, Canon Street and Catalina Boulevard featuring additional landscaping and safe pedestrian and bicycle paths." In a story about the mid-city bike corridor through Talmadge, one commenter doesn't want more bike lanes. But remains curiously silent about SANDAG's plans to keep funding freeways. Amgen California will return to San Diego next year. Caltrans plans to buy part of Manchester Ave. strawberry fields for a Park and Ride. It's a miniscule part of the $6.5 billion I-5 widening plan Caltrans has cooked up despite also admitting that more roads mean more traffic. Many bike projects are scheduled to begin construction in the new year. Imperial Beach is doing a lot of bike friendly things and becoming a safer city too. In Coronado City Problems: the San Diego County Bicycle Coalition wrote an open letter asking for reasonableness. Coronado resident writes a letter about the bike advocate infiltration. In Encinitas: a reasonable letter asking for more than the status quo half measures. Only in Southern California, do we have a story that starts as follows, "[o]ne of Carlsbad’s busiest coastal parking lots...". Fear not since the story is a few weeks old and so the parking lot is back in business. In another part of Carlsbad, plans for a bike park and more were brought up at a recent community meeting. At least one County Supervisor, Greg Cox, gets it. Here is a great profile about him. City of Oceanside has installed speed monitors, relying on driver's behavior instead of proven design to ensure road safety. Painted lines don't protect bicycle riders from drivers from driving into them. Hope the three riders who were struck are back on the bike soon. Annika Walden of Encinitas wants safer bike lanes. Darius Degher pens an ernest essay on how bicycling will save us. 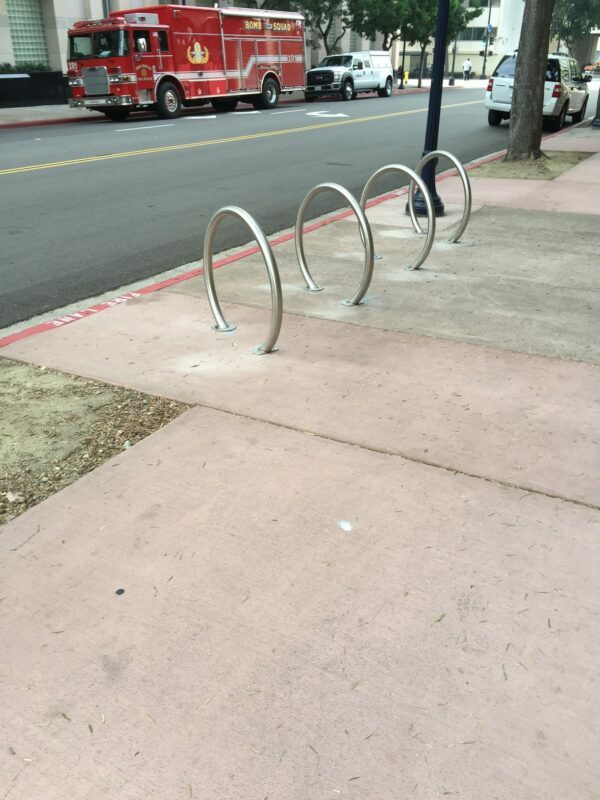 Carlsbad's Thomas Arnold gripes about unused bike racks. Maybe instead of complaining, he could consider riding his bicycle and locking his bike to said racks and inspire his neighbors and friends or give him a parking space to someone who cannot ride a bicycle? Twelve-year old Oceanside boy killed in collision with pickup while riding his bike to school. His family needs help. Residents say the stretch where he was killed is unsafe. They say you never forget how to ride a bike, but the childhood sense of marveling at the simplest things fades unless we keep it alive somehow. More news next week. Putting this together took a while. In an effort to document the varied riders that currently ride in San Diego here is the first in a set of photographic profiles for your viewing pleasure. Leave a comment to let us know where we can get some good shots of riders riding to work (or for daily errands).